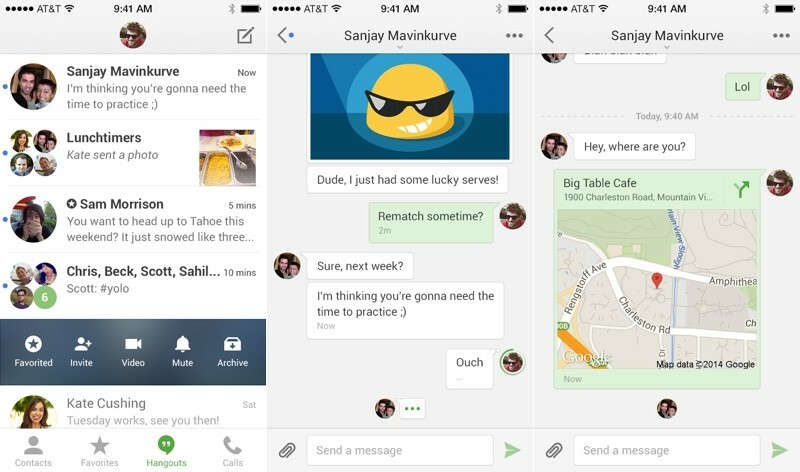 Google has released a complete redesign of its Hangouts mobile messaging app on iOS. Version 2.0 is the first major update since the company added phone calls late last year, and aside from introducing a visual refresh that’s more consistent with Apple’s current design language, it also brings several new features including animated stickers, 10 second video messages, and a two-pane view on the iPad. Google’s Frank Petterson made the announcement on Google+ this morning along with a quick rundown on the new features. The app offers shortcuts to your Hangouts contact list, favorite people to chat with, recent Hangouts, and voice calling to regular phones over the Internet -- free in the US and Canada only. The new video messaging feature works within the same camera option under the paper clip icon found at the bottom left of open chats. Whereas tapping the shutter button produces a quick snap to share in one-on-one or group chats, holding down the same button will start recording up a 10-second video message. You can also send images from your device’s camera roll (still no pre-recorded videos, though), send one of the app’s 40 or so animated stickers and share a map of your current location to meet up with friends. As for the iPad-specific improvements, you’ll now get a nice two pane view as well as picture-in-picture video calling, which supports up to 10 simultaneous users and is essentially a free video conferencing service for iOS. Petterson also cites a bunch of performance improvements but the much requested integration with Google Voice is still a no show. There’s also no quick or intuitive way to initiate a free voice-only call with other Hangouts contacts; instead, you’ll have to start a video call and then both can turn off their cameras. No word on when the new features are coming to Google’s own Android platform.